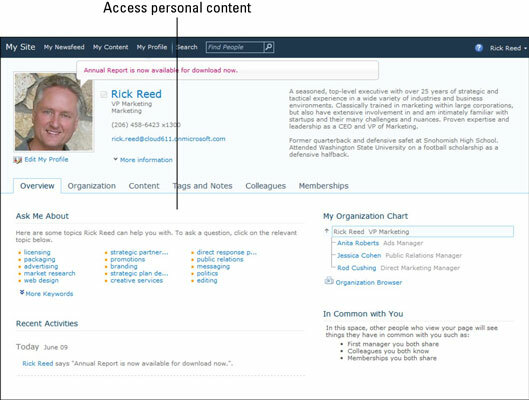 If your company subscribes to the Office 365 enterprise plan, you will have access to SharePoint Online social features, including My Site, which is a public page designed to let you share information about yourself with others who visit your site. The My Profile page in My Site is a great place to market your skills and expertise. 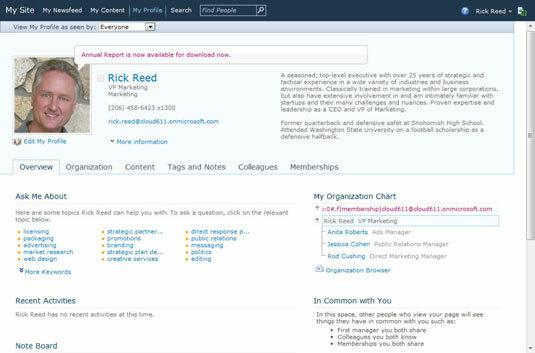 It also serves as a central repository of information you can easily access. Think of My Site as Facebook in the workplace. Just like on Facebook, you enter your status in the status balloon above your profile photo in the My Profile page. Your colleagues can leave notes and messages for you on the Note Board just like your Facebook friends can post on your Wall. The idea behind using the status updates and notes is not just to bring social computing into the workplace. Entries in the status update end up in your What’s New feed under My Site, which then shows up in your colleagues’ pages, if they have added you as a colleague. Notes you post show up in the Recent Activities feed under My Profile. The What’s New and Recent Activities feeds become your team’s collaboration tool for notifications, side conversations, quick questions and answers, and basically function as a virtual hallway conversation. What does this mean for your organization? It means fewer e-mails going back and forth between you and your colleagues on things that may already be outdated by the time either of you get around to reading them. As your e-mails gets focused on action items and in-depth conversations, you may find that you spend less time sorting through and cleaning up your inbox. When you create a personal site, you essentially create your own SharePoint site collection. This site collection is automatically created under the My Site host as specified by your organization’s network admin. As with any SharePoint site, you can create document libraries, maintain a blog, set versioning control for your documents, and set permissions for your documents and lists. These libraries, lists, and blogs are then aggregated and displayed in the Content section in My Profile.